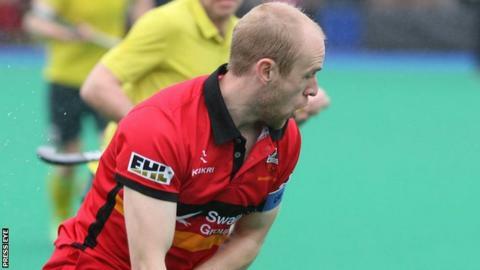 Banbridge beat Annadale 3-2 in the men's Irish Hockey League in a feisty Ulster derby at Strathearn School in Belfast on Saturday. The visitors trailed 1-0 at half-time but surged ahead with three unanswered goals after the interval. It was only the third win in nine games for Banbridge this season. In the battle of the top two Glenanne strengthened their grip on first place with a 5-2 victory over Three Rock Rovers. Annadale dominated the first half of their encounter with Banbridge but only had a Fergus Gibson goal to show for it. Playing their first game in seven weeks Banbridge, who welcomed Irish international Eugene Magee back into their line-up after injury, turned the game around in the third quarter. From their first penalty corner Philip Brown's drag flick made it 1-1 and from their second, after an initial save, Jonny McKee's cross was turned into the net by Peter Brown. Jamie Wright bundled in the third goal for Bann in the final quarter but a strike from a penalty corner by Rhiley Carr gave Annadale hope and led to a frantic finish with Banbridge holding on for a vital three points. The title now seems to be Glenanne's to lose as they opened up a seven-point gap over Three Rock Rovers after a 5-2 win. The game was tied at 2-2 before Glenanne scored three times in the final four minutes. Lisnagarvey's game with Pembroke at Comber Road fell victim to a frozen pitch so Monkstown took their opportunity to move into third place with a 2-0 home win over Railway Union. Cookstown's match with Cork C of I was also postponed. Pegasus made the semi-finals of the women's Irish Senior Cup after goals from Alex Spears and Lucy McKee gave them a 2-0 win at Old Alex. In a rearranged second round tie Loreto knocked out Monkstown 2-0 and will next face Railway Union in the quarter-finals. However, the other two second round matches that were due to take place, between Ulster Elks and Lurgan at UUJ and Belfast Harlequins and Pembroke at Deramore, were both called off due to frozen pitches.